This is the wheel version of spinning tutorials. You can find the drop spindle one here. If you learned on a drop spindle you’ll already have the basics of spinning down. All you’ll have to do is learn to operate the foot pedal while moving your hands. However, if you decided to go for the big stuff first you’ll want a little more background. The following videos are helpful for both complete beginners and drop spindlers. It’ll let you get a feel for how a wheel works. This is one from Paradise Fibers. It is the second half of a two-part series on setting up and using a Lendrum wheel. Lots of good things are covered, and you can get a feel for how a single drive band works. While I was up to my ears in carded Corridale and the wonder of a wheel, my wonderful aunt—the same aunt who showed me the SpinOff magazine—sent me a package of fiber. And not just any fiber. 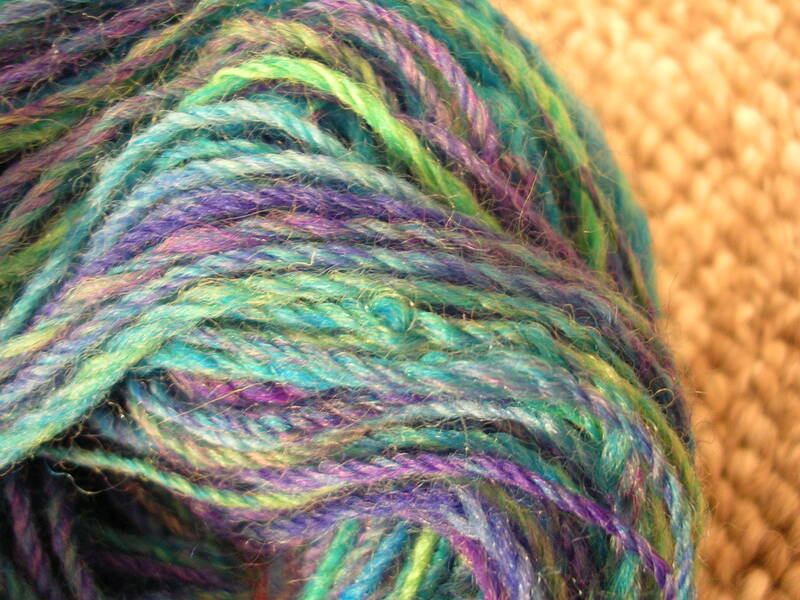 Four lovely ounces of Northern Lights in the “Violets” colorway. I was supposed to spin them up for her to use in a knitting project. The fiber drafted beautifully! It was so nice to have the thin strip to work from instead of the big chunks that I would pull off from the sliver or top. And the colors! Excuse me while I go gaze at them again. The camera did not do them justice.